The Bibliophile's Lair » Random! 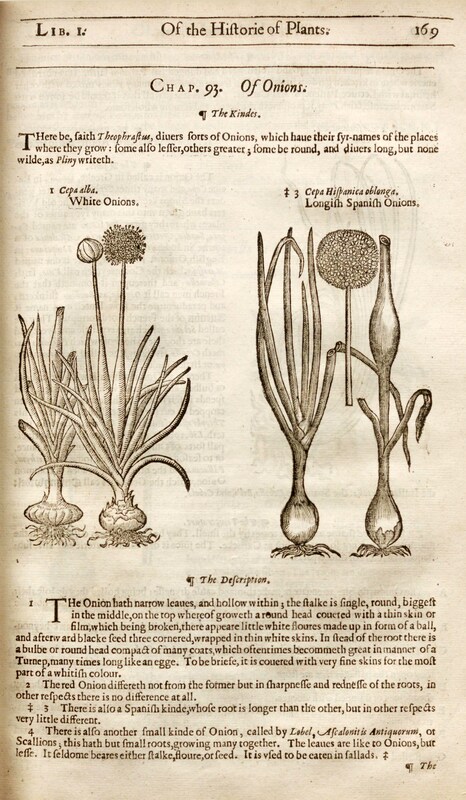 The Herball; or, Generall Historie of Plantes (London, 1597), and The Herball, or General Historie of Plantes . . . very much enlarged and amended (London, 1636). 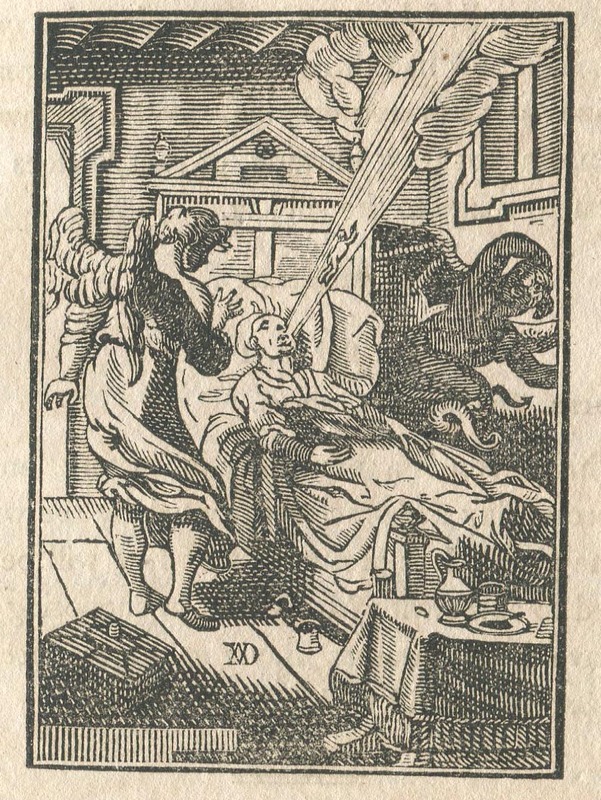 The story is famous: John Norton, Queen’s printer, wished to bring out an English language version of Dodoen’s Pemptades of 1583 and hired a certain “Dr. Priest” to do so, but the translator died with the work only partially done. 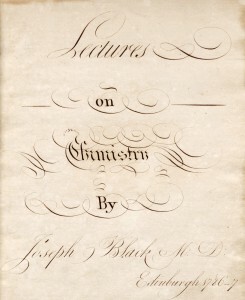 A copy of the manuscript translation made its way into John Gerard’s hands and he seized the opportunity, reorganizing the contents, obscuring the previous translator’s contribution, incorporating aspects of Rembert and Cruydenboeck’s works, and commandeering the result as his own. Gerard abandoned Dodoen’s classification, opting for l’Obel’s instead, and, in a stroke of ambition and brilliance, illustrated the work with more than 2,500 woodcuts of plants. 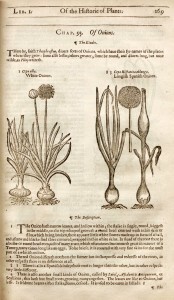 Many of these are large and all are attractive but more than a few were of plants he himself did not know, thus leading to considerable confusion between illustration and text in the earliest editions, this being third overall and the second with Thomas Johnson’s additions and amendments. 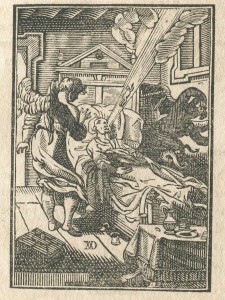 For both Johnson editions a large number of the woodcuts were obtained from the famous Leyden printing and publishing firm of Moretus, successors to the highly famous firm of Plantin. 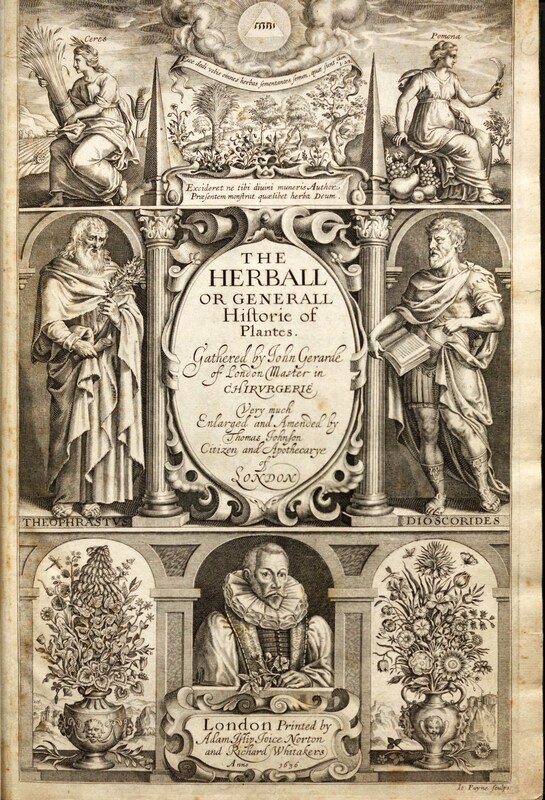 As Johnston notes: “Most of the cuts were those used in the botanicals published by Plantin, although a number of new woodcuts were added after drawings by Johnson and Goodyer” (Cleveland Herbal . . . Collections, #185). 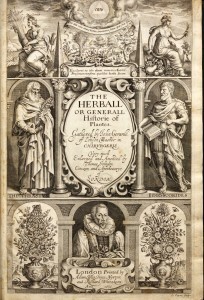 The large thick volume begins with a handsome engraved title-page by John Payne incorporating a bust of the author, urns with flowers and herbs, and full-length seated images of Dioscorides and Theophrastus and of Ceres and Pomona. Replacing the missing initial blank is a later leaf on which is mounted a large engraving of Gerard. The text is printed in italic, roman, and gothic type. There is, to us, a surprising and very interesting section on grapes and wines. The first part of our caption delights partly in discovery that maize, the “corn” of the U.S., is here called “turkey wheat” — with further note that you can make bread of it, but that the result is pleasing only to “barbarous” tastes! The entry as a whole shows Gerard at his characteristic best, at once scientifically systematic and engagingly discursive. García, Gregorio. 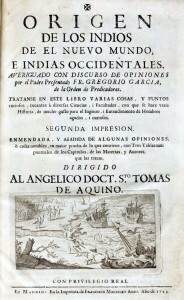 Origen de los Indios de el Nueuo Mundo, e Indias Occidentales. (Madrid, 1729). Nowhere is the general confusion and genuine indecision of the sixteenth and early seventeenth-century theorists of Indian origins more pronounced than in this work—the first book published exclusively on the issue [this is the 2nd edition, it was first published in 1607]. García spent nine years in Peru, beginning in the late 1590s. 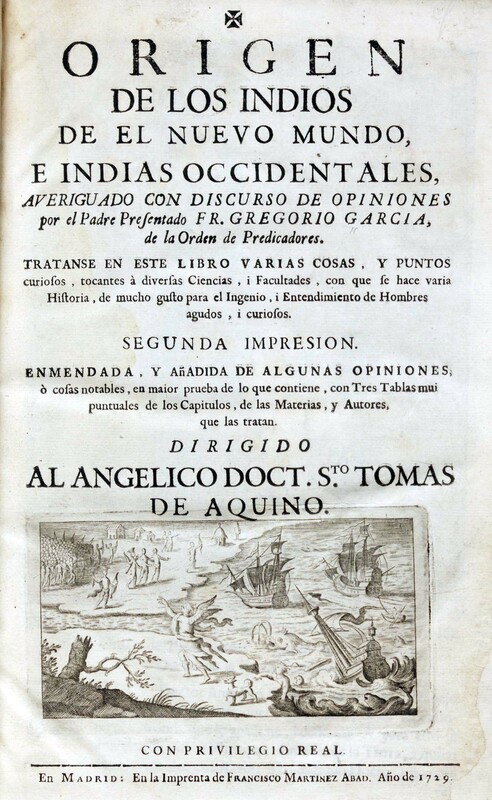 In order to discover as best he could what the origin of the Indians was, García evaluated what he read, what he was told by both Spaniards and Indians, and what he had seen. The two fundamental assumptions upon which he based his book were that all men and women descended from Adam and Eve, and after the Deluge from Noah (who divided the world giving Asia to Shem, Egypt and Africa to Ham, and Europe to Japheth). He believed that the peoples of the Americas came to the New World from one of the three parts of the known world. García examined in detail all the opinions regarding origins current in Europe at the time–derived from the Carthaginians; the lost Jewish tribes; that Peru was the Ophir of Solomon. 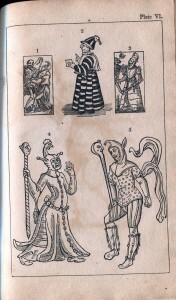 The “libro ultimo” contains native accounts of their origins, describing the tribes of Mexico and Peru, derived from a manuscript of Juan de Vetanzos (a companion of Pizarro). He rejected none of the origin theories, but accepted them all collectively—that is, in his view, the ancestors of Native Americans came to the New World from different parts of the known world, at different times, and in different ways. The New England primer. (Providence: John Waterman, 1775). 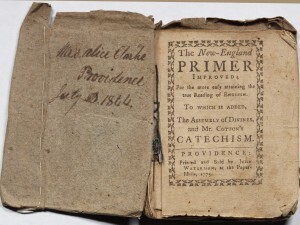 The New England Primer stands at the forefront of early American schoolbooks. The first mention of it occurs in the register of London Stationers in 1683, under the title The New England Primer, or, Milk for Babes. One of its predecessors in England was The Protestant Tutor, which, like its successor, contained the alphabet, the syllabarium, the Lord’s Prayer, the Apostle’s Creed, and the picture of the burning of the Protestant martyr John Rogers. 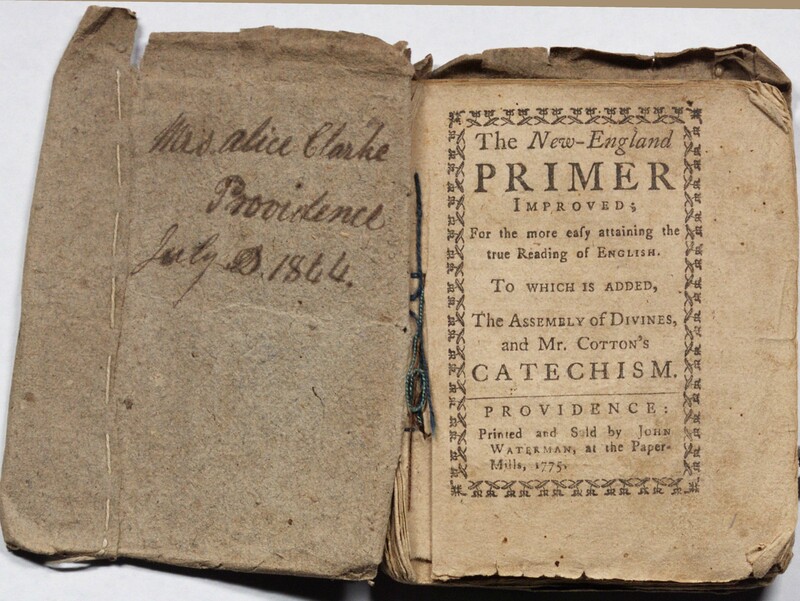 The earliest surviving primer produced in America was printed in Boston, 1727—by which time it was a staple product of the colonial printer. The print shop run by Benjamin Franklin and his partner David Hall printed over 37,000 copies between 1749 and 1766, and only one copy has survived. 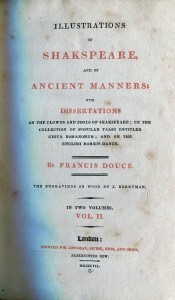 It has been estimated that from 1680-1830 six to eight million copies were produced (only about 1,500 survive). Portraits of English kings (e.g., George II and III) were replaced eventually by famous Americans (e.g., John Hancock, Samuel Adams, and George Washington). Around 1790 the primers were secularized, and little boys and girls ceased to be promised salvation or threatened with eternal fire; girls were instead warned that “pert Miss Prat-a-pace” was to have no treats unless she turned into “pretty miss prudence,” and that good boys would be rewarded with “credit and reputation,” whereas bad ones would live in beggary. We have dozens of examples of the NEP, and thousands of other early American schoolbooks in our Barnard Collection. I am taking a week-long intensive course called “Teaching the History of the Book,” for professional development. 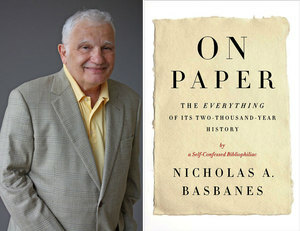 After driving 450 miles from Hartford to Charlottesville (and then getting lost in the town because I have no smart phone or GPS), I stagger to the front desk of my hotel and who should I meet coming out of a cab but Nicholas Basbanes—author of the recent book On Paper: The Everything of its Two Thousand-Year-History (Knopf, 2013). I first encountered Nick’s now-famous work on book collecting, A Gentle Madness, in graduate school in the mid-90s, and met him in person in 2002 when he spoke at a book collecting contest I was managing at Brown University. He is one of the featured evening speakers this week. I stuck out my hand and said, “Nick, you don’t remember me but I use your books in my classes, and I brought my copy of On Paper for you to sign at your talk tomorrow night.” We were both travel-weary, and the rooms were not ready, so we went out for a beer and talked—mostly he talked about a book he has just sold to Knopf about Henry Wadsworth Longfellow. At the registration and reception, I saw some old friends and met some new people, and most importantly caught some excellent gossip (a staple of the rare book world). No time to socialize more, since my instructor sent around a link this afternoon to another 1,200 pages of resource material to become familiar with before we begin tomorrow morning at 8:20am!! Welcome to Boot Camp for Bibliophiles! 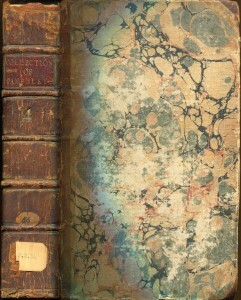 In a humble little volume with the spine title “Collection of Pamphlets” (volume 14), bound with six other unrelated titles, is The Journal of Major George Washington sent by the Hon. Robert Dinwiddie, Esq; His Majesty’s Lieutenant-Governor, and Commander in Chief of Virginia, to the Commandant of the French Forces on Ohio . . . with A New Map of the Country as far as the Mississippi. Intitially printed in Williamsburg in 1754 (of which there are only seven (7) copies reported in institutional libraries), ours is a copy of the London reprint of the same year, held by thirty (30) other libraries. Washington’s fame at home and abroad begins with this pamphlet. “In the early part of the 1750s French and English forces were expanding into the Ohio Valley, both forming alliances with Indian tribes and setting up trading encampments. In 1753 the French took possession of a tract of land within the chartered limits of Virginia. They then proceeded to erect a chain of military posts from Canada to the Ohio River. All the while, French soldiers and traders made their way up from the south and down from the north, taking possession of the Ohio country. The French encroachments on the English settlements forced Virginia Governor Robert Dinwiddie to send a commission to warn the French to halt their advances. However, the commission stopped 150 miles short of the French posts and turned back after witnessing the slaughter and defeat of the Indians by the French. An officer in the Virginia forces — Major George Washington — was recommended to Dinwiddie as an up-and-coming light, someone who might accomplish the mission. Although only 21 years old, Washington was appointed by Dinwiddie to go into the Ohio Valley and deliver a letter to the commander of the French forces, warning him against their actions in violating British rule over those lands. In addition, Washington was to observe French activity and enforcements, and make friends with the Indian tribes. On October 31, 1753 Major Washington set out from Williamsburg with a small band of men experienced in the ways of the wilderness. The group consisted of Jacob Van Braam, a Dutch soldier of fortune and French interpreter; Christopher Gist, a Virginia frontiersman of great renown; two servitors; two Indian traders and accompanying horses. During Washington’s 78 days in the wilderness he met with chiefs of the Indian nations and delivered Gov. Dinwiddie’s letter to the French Commandant, LeGardour de St. Pierre. In a private meeting with Major Washington the French Commandant refused to back down. I celebrate the 250th post to this blog with a note that we have some great early Caribbean resources, which can relate not only to academic work on campus, but real-world cultural studies, like the “Trinity-in-Trinidad” program. 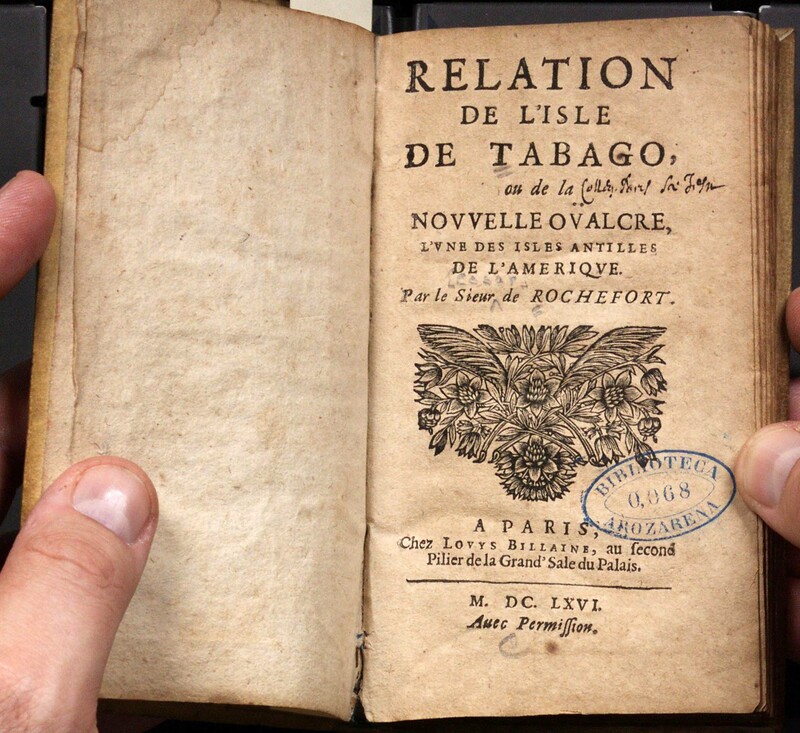 Relation de L’Isle de Tabago (Paris, 1666). Charles de Rochefort (1605–1682) dedicated this work to three men who formed a project to encourage settlers in the island of Tobago. They had transported a number there under the auspices of the States-General of the Netherlands, and this work was intended as a guide for settlers—giving details of the customs of the indigenous people, climate, and the island’s potential for production (including sugar cane, ginger, and especially tobacco). 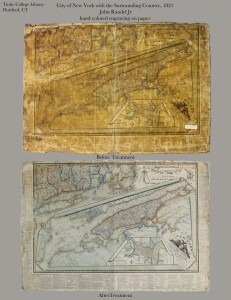 As you can see from both of these works, the Dutch and the English (not to mention the French) were hugely interested in developing colonies in the Caribbean, in order to compete with the Spanish and the Portuguese imperial projects which had been in operation for well over a century by the time these two works were published. 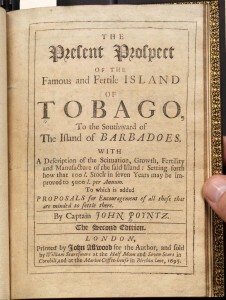 The Present Prospect of the Famous and Fertile Island of Tobago (London, 1695). In 1681, four ships commanded by John Poyntz (1629-1712) captured a Dutch settlement on Tobago. In 1681, he obtained 120,000 acres on the island on behalf of a group of merchants, and two years later he published this pamphlet promoting the benefits of the island as a place to settle. 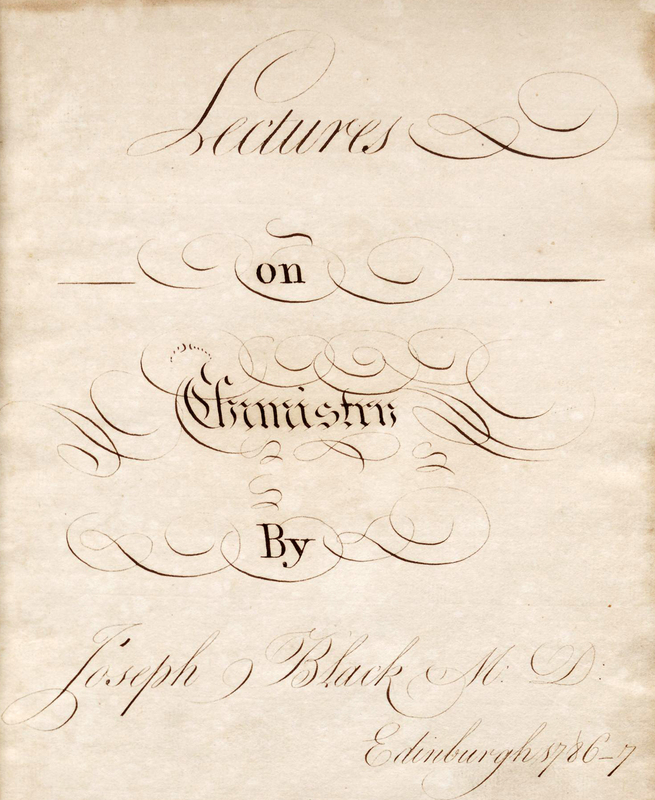 This “very well informed survey” (Oxford DNB) describes the climate, flora, fauna, and timber of the island, and prospects for growing cocoa, sugar-cane, and tobacco. Several hundred settlers from Barbados moved to Tobago, but the king blocked Poyntz’s project and they were returned to Barbados. John Randel, The City of New York as laid out by the Commissioners with the Surrounding Countryside (New York, 1821). A copy of this map recently came up for auction in New York, and although the one for sale was printed on satin (and is therefore much more valuable on the collector’s market), ours is still a scarce and important copy (one of only two or three known). 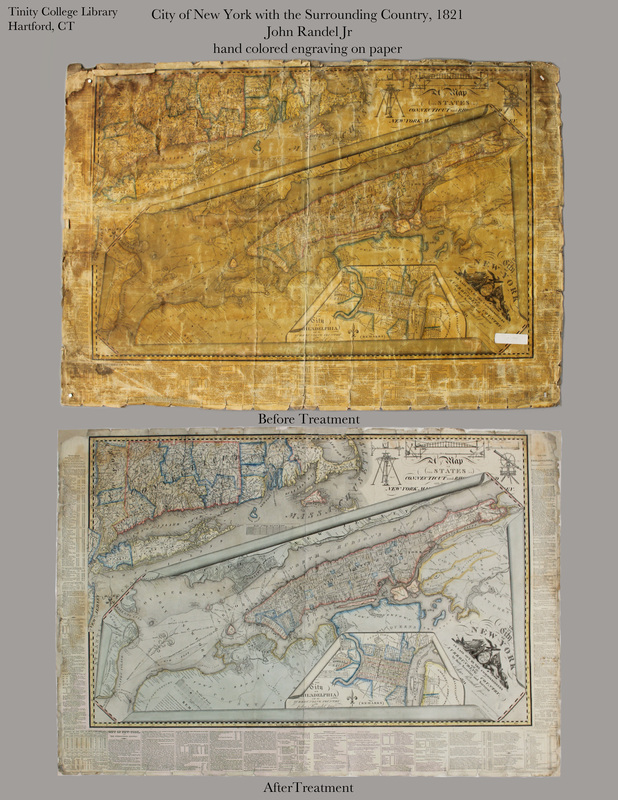 We have contracted with a conservator to address some condition issues, to ensure this map can be used and displayed. 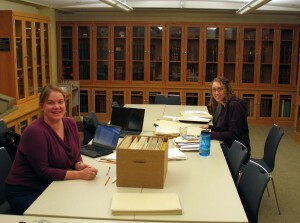 Here are “before and after” pics–our conservator, Sarah Dove, worked miracles! As New York City entered the 19th century, It became clear that plans for its expansion northward were in order. The narrow streets from the early Dutch and English settlers could no longer handle the increasing population. This was coupled with an increase in disease spawned by the close quarters of the city at that date. In 1807 the Common Council of the city petitioned the State Legislature to create a Board of Commissioners to oversee the laying out of a future street system. The board was created and mandated to finalize its plans within a four year period. Governor Morris, Simeon de Witt, and John Rutherford became the commissioners. Simeon de Witt had been the Surveyor General for the state and had become impressed with the work of one of the surveyors under his charge, namely John Randel. Randel was hired as chief engineer and surveyor for city. He began his work soon after. Though Manhattan Island was hardly a wilderness, it contained 60 miles of running streams, around 20 ponds and lakes, as well as hills, valleys and plateaus. With some surveying instruments of his own devise, Randel set to work. The difficulties of topography were not the only obstacles he was to encounter. Free-holders and lease-holders on the land being surveyed were fearful of losing their land and their rights. Randel was arrested a number of times for trespassing, and just as many times released on the order of the City Council. Randel finished his project a bit ahead of schedule. The survey overlaid with the now famous grid street plan was ordered to be prepared for publication under the direction of William Bridges. Peter Maverick, the well known engraver, was chosen to engrave the map. The map map appeared in 1811 (Haskell 651) and is based almost entirely on the survey conducted by Randel, with some additions by Bridges. Randel’s name did not appear on the map. Thus began a long and acrimonious relationship between Randel and Bridges. Randel claimed that Bridges had not copied his survey faithfully and that it was full of errors. Randel took charge of the survey and embellished it further. 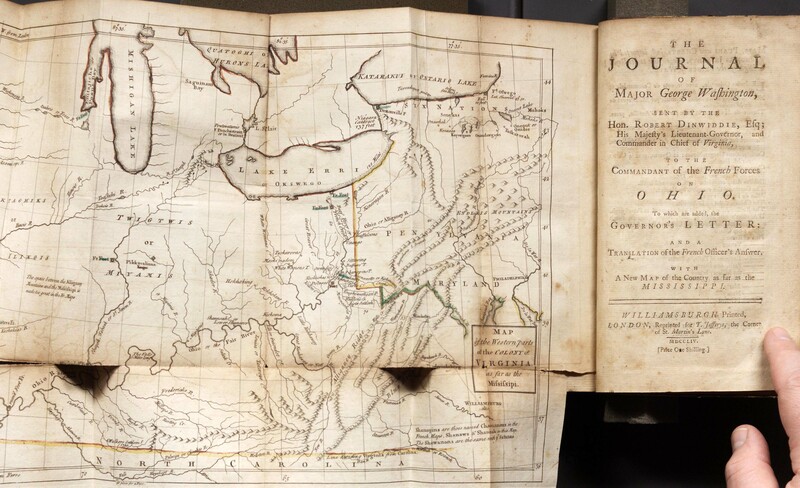 He was set to have it published in 1814 but decided against it -the British had recently burned Washington and Randel feared his map would be too great an aid to the enemy should they decide to attack the city. The manuscript copy of the Randel embellishment is currently under the protection of the New York Historical Society. In 1821 the finalized version of the map appeared under Randel’s name (his name appears 3 times on the map). The grid system begins with 1st street and runs northward to 155th street with the streets running from east to west. It is intersected by 12 avenues running from south to north. It is the grid which modern day inhabitants and the city’s many visitors have come to count on for easy navigation of the metropolis. 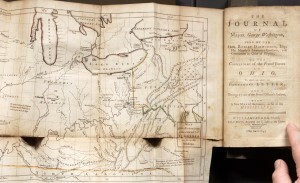 The Randel map was printed on paper and a very few seem to have been printed on satin. The only other existing copy on satin that we can locate is held by the New York Public Library, gifted by the well-known New York iconographer I. N. Phelps Stokes, who had acquired it from Randel’s nephew. Two paper copies are known. In addition to the great importance this map bears in its relationship to the mapping of the city, it is a beautiful map to behold. In addition to the grid plan for New York City, there are incorporated maps of parts of Connecticut and Rhode Island as well as an inset of the city of Philadelphia. These are neatly overlaid on one another and with a trompe l’oeil effect they appear to roll in upon themselves. For the fullest and most succinct history of the evolution of the map, Augustyn and Cohen’s Manhattan in Maps should be consulted. John Robinson, Professor of Natural Philosophy at Edinburgh and a former student of Black, was chosen to compile and edit the lectures, which were published in 1803. We have in the Watkinson the first American edition (Philadelphia, 1807), which (interestingly) contains a list of 138 named subscribers, who ordered 528 copies, all told (the largest order by far was from Birch & Small, 200 copies). 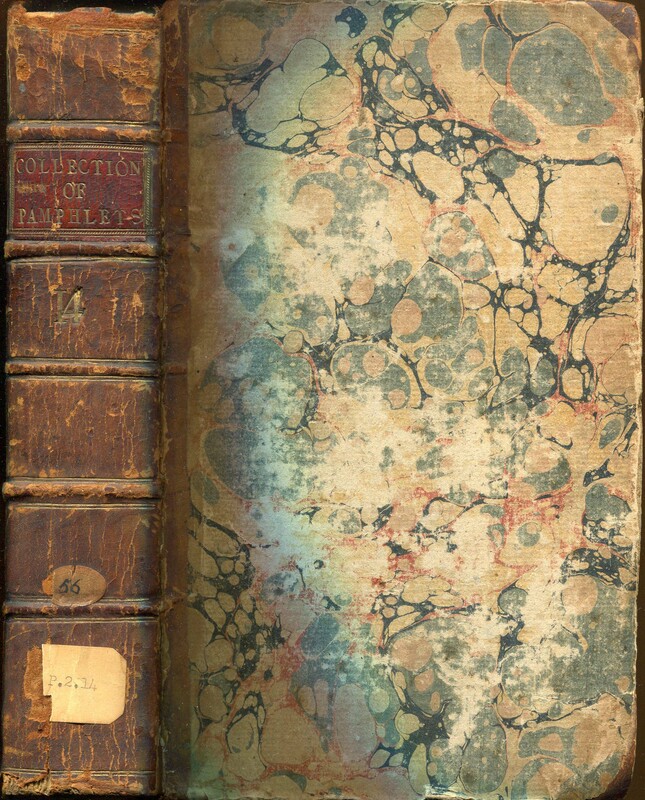 Another factoid of interest is that this copy was formerly owned by George Brinley, Jr. (1817-1875), the great Americana collector, who was a founding Trustee and second President of the Watkinson Library (75 years before it came to Trinity College). Brinley gave this set to Trinity in 1842. 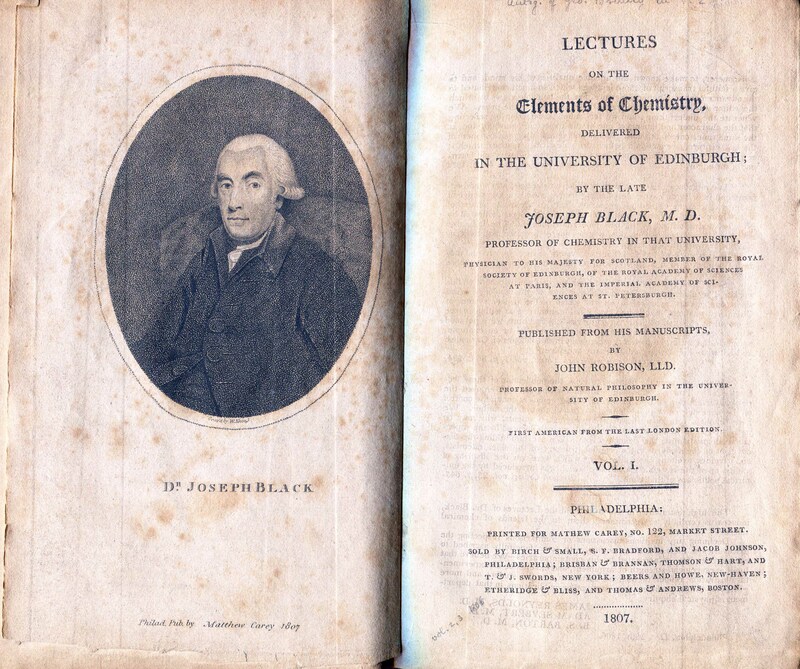 It might be a fascinating project for a student to compare our copy of the lecture notes with the published version, as a book history project. Comments Off on Great chemistry! This is the sort of use we aim for in the Watkinson! Today in the Enders seminar room, graduate student Meg Campbell is processing the Cinestudio archives, and contract archivist Rachel Hoff is processing a small collection of records related to Trinity’s development of the Learning Corridor. 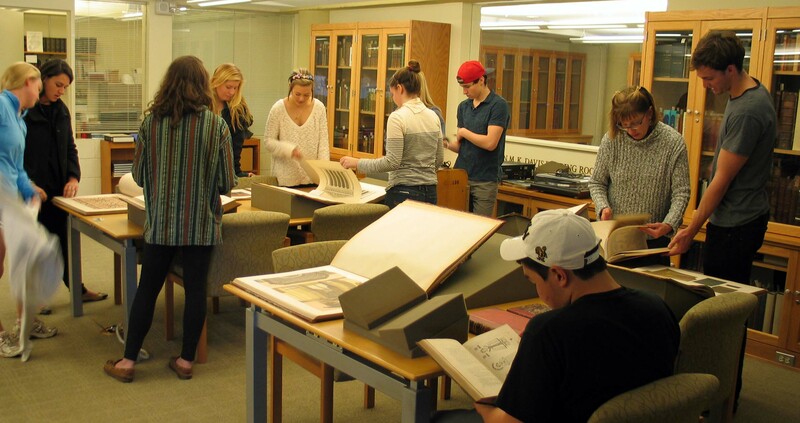 Occupying one half of the Reading Room, 1/2 of Kathleen Curran’s Art History class (19thC architecture) is examining books from our collection of the professional library of architect J. Cleveland Cady (1837-1919). 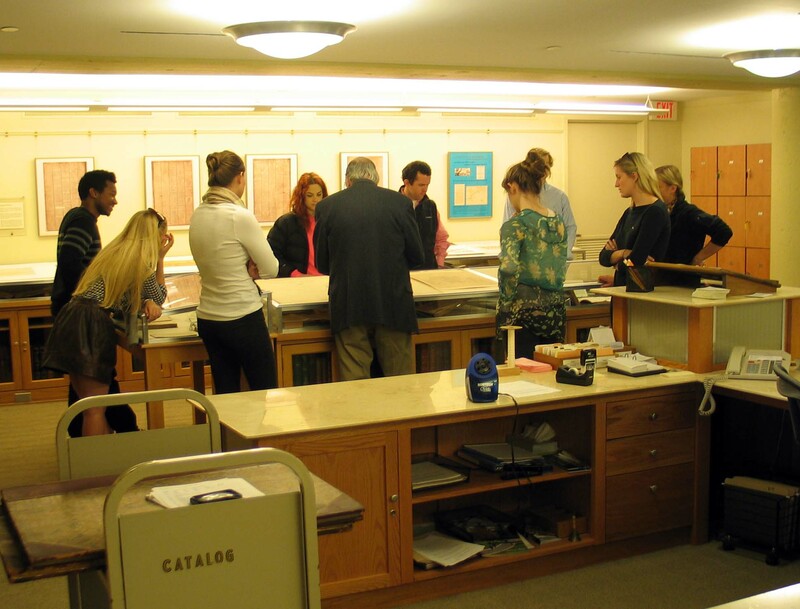 And in our exhibition area, archivist Peter Knapp holds forth to the OTHER 1/2 of the class on the concept drawings done by William Burges for the Long Walk done in the 1870s. After half an hour, the class switches, and so they get two presentations for the price of one! Comments Off on Yep–we’re busy! I saw the following description of a book for sale in the trade and discovered to my relief that we had a copy! 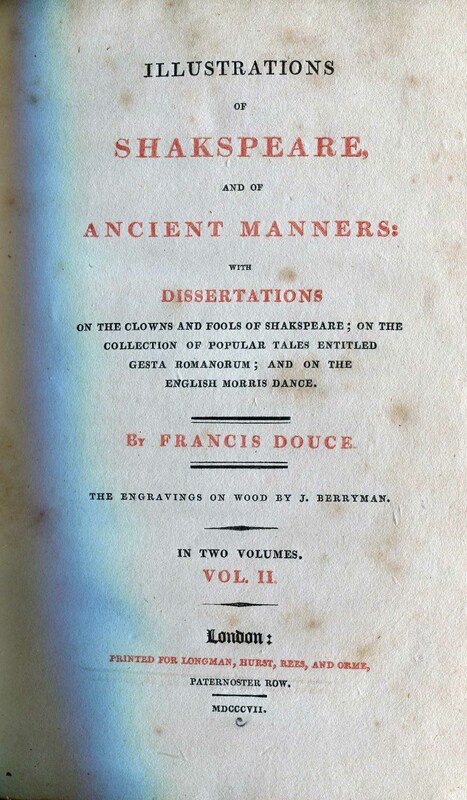 Illustrations of Shakespeare, and of ancient manners: With dissertations of the clowns and fools of Shakspeare; on the collection of popular tales entitled Gesta romanorum; and on the English morris dance. London, 1807. O beat away the busy meddling fiend / That lays strong siege unto this wretch’s soul. II. The clown, who was 1. a mere country booby. 2. A witty rustic. 3. Any servant of a shrewd and witty disposition. III. 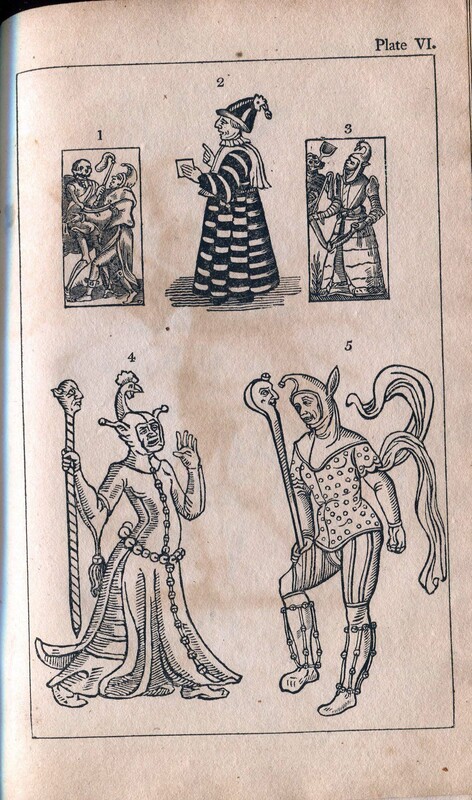 The female fool, who was generally an idiot. IV. The city or corporation fool, whose office was to assist at public entertainments and pageants. V. Tavern fools. These seem to have been retained to amuse the customers. You are currently browsing the archives for the Random! category.